We’ve found people either absolutely love beets or don’t like them one bit. If you’re one of the later, consider roasting them as beet chips, it’s an easy way to baby-step into an affinity for these sweet roots. This recipe for beet chips is from NPR. You can’t go wrong with this combination of sweet, salt and crunch. Preheat oven to 325 degrees. For easy cleanup, line a large rimmed baking sheet with parchment paper. Place beets in a large bowl and, using your hands, toss with oil and seasonings until coated. Arrange in a single layer on the prepared baking sheet. Bake for 30 to 35 minutes or until crisp. Remove from oven and eat. Beet Burger One of our most favorite restaurants, The Tree House Cafe, used to make grilled beet burgers with a garlic chili aioli sauce and heaped with fresh, crunchy greens and sprouts. Roasting beets is such a treat, but it’s a shame to turn the oven on during the hot days of summer – so put them on the grill instead! I’ve hunted online for a similar beet burger recipe and found this one – looks delicious: Beetroot and Feta burger. Gazborscht An amazing cold beet soup. If you want to add a little heat, throw in a seeded jalapeno or two. For maximum refreshment, take some time to prepare this ahead of time as it will need some time to chill. This recipe has been modified from Veganomicon: The Ultimate Vegan Cookbook, by Isa Chandra Moskowitz and Terry Hope Romero. Place the shredded beets in a soup pot and add the water, tomato paste, and salt. Partially cover the pot, leaving a little room for steam to escape. Bring the water to a boil and then simmer for 5 minutes; the shredded beets should be tender but have a little crunch. Remove from the heat and let cool completely. In a food processor fitted with a metal blade, place 1/2 the cucumber, half the tomatoes, and half the onion. Add 1 cup of the cooled beets and their liquid, and the bread, olive oil, and lemon juice. Process for about 15 seconds; the mixture should be chunky but you shouldn’t be able to detect the bread. Add the rest of the cucumber, tomato, and onion, plus the cilantro, to the processor. Pulse about ten times so that the soup is still chunky. Add this mixture to the rest of the cooled beets. Add freshly ground black pepper and salt to taste. Pour into a container, cover, and shill for at least 30 minutes or until ready to serve. Garnish each bowl with thin slices of avocado. Beet Salad in Raspberry Vinaigrette This salad uses both beets and their greens, so use young beets that have fresh, crisp greens. The recipe calls for raspberry vinegar, but this can very easily be substituted for with orange juice. Adapted from our very well-worn copy of The New Vegetarian Epicure by Anna Thomas. 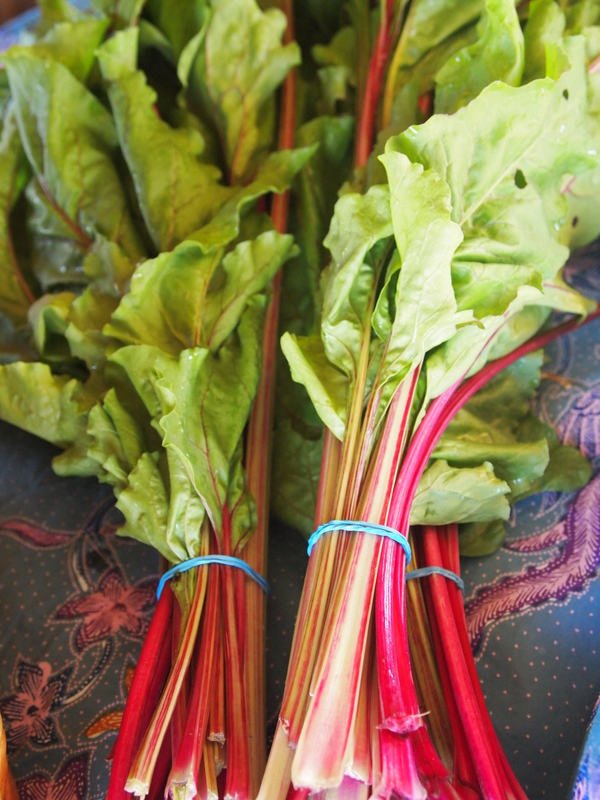 Cut the greens off the beets, leaving about ½ inch of stem, reserve the greens and scrub the beets well. Arrange the damp beets close together on a sheet of aluminum foil and scatter 6-8 unpeeled garlic cloves over them. Wrap the beets in the foil, folding over and crimping the edges to make a tight seal. Bake the beets in the foil packet in a 400 deg oven for about 1 hour. Meanwhile, wash the beet greens, discard those that look anything less than fresh and lovely, and cut off the stems. Slice the greens in ½ inch strips. Heat the olive oil in a well-oiled cast iron or non-stick sauté pan, add the minced garlic, stir for ½ minute, then add the sliced beet greens and a sprinkle of salt. Toss over a medium flame until the green are completely wilted and sizzling in the pan, about 5-6 minutes. Remove the pan from the heat. In a small bowl, whisk together the honey and raspberry vinegar. Drizzle 2 Tbs of this mixture over the beet greens in the warm pan and toss to combine thoroughly. When the beets are cool enough to handle, cut them into slices or chunks. Squeeze out the soft garlic, mash it with a fork, and whisk it into the remaining vinegar-honey mixture. Pour this over the beets in a bowl, and add chopped scallions, salt and pepper to taste, and the sautéed greens. Mix everything together well. Serve the salad warm or at room temperature, alone or on a bed of salad greens. Garnish each serving with a sprinkle of crumbled cheese. Heat olive oil in a skillet, low-med heat, add minced garlic. When garlic starts smelling amazing, add beet greens. Heat greens until they are tender. Season with salt and pepper. Enjoy with eggs, on a sandwich, or by themselves. So good! Blanch the greens – Half fill stockpot with water, cover, and bring to a boil. Meanwhile, fill large bowl with ice water for blanching. Clean beet greens well and remove stems. One bunch of beets will yield 3-4 cups of greens. Add enough kale leaves (also cleaned and with stems removed) to make 8 cups of greens. When water is boiling, add greens and stir. Cook for two minutes, then scoop greens from boiling water with a large slotted spoon and plunge into ice water (If you are in the process of making dinner, add pasta to the water that is already boiling and set timer). Swirl greens around in ice water to cool. Drain and gently squeeze out excess water. Roughly chop greens. Add greens, oil, garlic, sunflower seeds, parmesan and lemon juice to food processor (or use immersion blender) and process until uniform and smooth—you still want tiny bits of the greens, not a puree. Taste and add salt, pepper, and additional lemon juice if needed. The recipe makes about 1.5 cups. Use about 2 tablespoons of pesto per serving for pasta. This is a recipe passed along to us from one of our CSA members, one who especially loves beets! In her words, “I did a little research and found a couple recipes for the salt roasted beets. We made this one last night and it was the BEST beets we have ever had at home. The skins rubbed off and they were the perfect texture. I found other recipes as well, but some of them required a 3 pound box of salt. I thought I would start with this recipe and use more if needed, but we will be sticking with this one. So good! Thanks for the awesome produce! ” It’s a recipe from Alexandra’s Kitchen. Roast the beets: Preheat the oven to 425ºF. Pour kosher salt into a shallow roasting vessel to make a thin layer. Place beets on salt bed. If using herbs, nestle a few sprigs among the beets. Cover pan tightly with foil and place in oven for about one hour, depending on how many and how big your beets are. Note: To test for doneness, remove foil and slip a pairing knife into one of the beets. If the knife meets little resistance, they are done. When beets are done, remove foil covering and let them cool. When cool enough to handle, rub off the skins and discard. Cut beets into nice chunks. Meanwhile, make the dressing: Place the orange juice in a small saucepan over medium heat and reduce to 1/3 cup. Let cool. Add vinegar, zest, shallots, chives and a pinch of salt. Let sit for 15 minutes. Slowly whisk in the olive oil. To assemble the salad, arrange greens on a platter. Top with goat cheese, walnuts and cut beets. Season with a pinch of salt and freshly cracked pepper. Spoon dressing over salad. As you plate the salad, the ingredients will all toss nicely together. Note: This method of serving is merely for looks — beets are so messy that if you toss everything together, it becomes one big red mess. If you don’t care about looks, go ahead, toss everything together. Storage tip: Leaving the top on root vegetables draws moisture from the root, causing them to lose flavor and firmness. Keep beets firm by cutting the tops off. Store beet greens separately, in a bag in the crisper drawer. Wash beets and keep in an open container with a wet towel on top. And if you’re looking for more reasons to love beets, read Tom Robbins’ Jitterbug Perfume. This entry was posted in fall, spring and tagged beets, fall, spring. Bookmark the permalink.